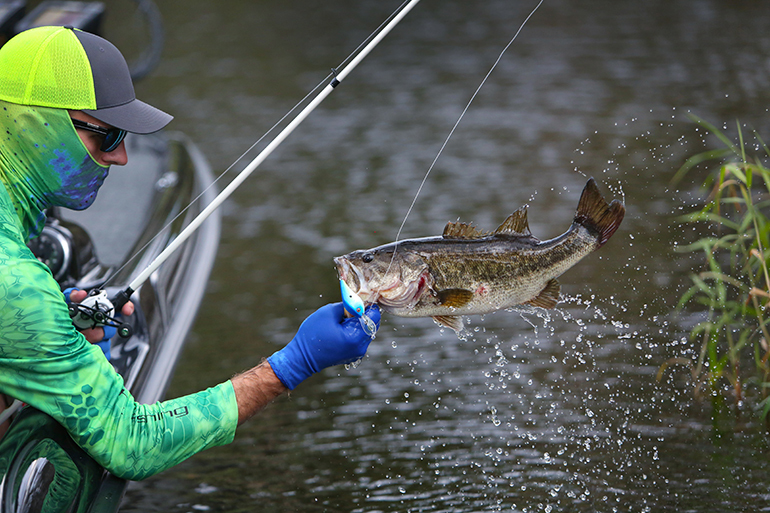 It’s early spring transition time for bass fishing in many parts of the U.S. When it’s winter one day and spring the next, the yo-yoing weather makes finding a successful bass-fishing pattern challenging. It’s time to dig through the junk and use your instincts to find limits this month. I once caught an 8-pounder practicing for a March tournament. I was flipping flooded timber near the back of a cold creek. It was 10 in the morning and warm. The sun was on the water. I was alone, and the birds were singing. Apparently, the stars were aligned. I approached a sandy, rounded point and made a shallow cast. The bait settled and the line walked away. I glanced around, giddy with excitement, making sure the competition wasn’t looking before returning the big girl to the water. I spent the entire tournament nearby. Despite warnings about the cold water and slow fishing, I crashed and burned up there. The warm water and better fishing was on the main lake, near the dam. Most fish catches were made deeper than the lucky one I made on a fish that moved up. I couldn’t get it out of my head. One fish, however big it is, does not constitute a pattern. Without history of fishing a lake or recent time on the water, it’s going to take time to build a pattern in any day’s bass fishing. The key is to minimize the time to do so. Don’t be stubborn. Dock-talk and fishing reports are useful, but the worst you can do is lock into a particular, unproductive pattern or place and burn away your day. Junk-fishing requires a healthy tackle investment. You need enough rods/reels on the deck to cycle through them, as necessary. Start with a few preferred search baits tagged to at least four spinning rods/baitcasters. Spinnerbaits are a good choice for covering water at various depths with each long cast. You’re looking for the aggressive fish in each school. If you can get a fish to go on blades this month, it tells you fish are moving. Shaky-head worms and tubes are good search baits. I like heavier weights (1/4-ounce) on light line to get down quickly. Pull up when the line goes slack to see if something is there, then shake it a time or two and immediately recast with the trolling motor on high. I’m simply showing the bait to as many fish as possible and flying down the bank. If a bass wants to eat it, he can. If not, I’m still learning. I’m testing the bite. How good is it? How many fish are there? How big are they? Lipless crankbaits are popular search baits, particularly around grass. They can be yo-yoed from shallow to deep water and ripped free, sometimes triggering a strike. Swimbaits are popular for locating bass by enticing them to follow and show themselves. When followers don’t bite, kill the retrieve. That sometimes works. If not, grab your finesse bait and cast to where the fish swam off to. Throw bigger, louder reaction baits in the wind and retrieve against the current, if possible. When the wind lies down, slow down and downsize. If you see dock pilings or a downed tree, grab a flipping stick. If your chart is showing a rockpile in 19 feet, check for fish arcs. If you see a school of bass, drop-shot those dudes or drag a creature bait over the structure. If baitfish are being pushed to the surface, pause and fish the commotion. Rip ’em with suspending, hard jerkbaits. If your lake gets stocked with trout, try trout-styled swimbaits or glides. It’s high-risk, high-reward fishing, but a few giants will always be keyed in on that food source. To catch fish, you must be around fish. Not profound, I know. But anglers spend too much time in areas where there are no bass. They attribute the slow bite to the bait, color, water depth, etc., and sift through their tackle boxes ad nauseam. Eliminate water by using nautical charts and sonar. I use a Navionics chip on the bow and console. I’m able to fish smarter by viewing topographic contours and unique features like flooded timber, channel swings, shoals, grass beds and rockpiles. These features identify fishing spots but also help you cover and/or eliminate water faster, safely (hazard identification is comforting, too). I review spawning areas, launch facilities, floating restrooms and other features in my garage. This saves time. The Navionics boating app is another good tool for this, as is Google Earth, and you can do all of this from your recliner. But you still have to use your senses and get baits wet. Don’t have a thermometer? Take a mental reading. If snowmelt is pouring into the tributaries, you can bet the water is cold up the creeks. If the runoff is warm rain, that’s different. Those inlets may be warmer than the main lake. Just the current caused by runoff may be a factor. It can ignite the bite and attract fish. In clear water where bass rely on eyesight to feed, muddy creeks are usually places to avoid. Baits get lost, and bass go into semi-shock mode until things stabilize. On the other hand, rattling crankbaits, jigs and other loud/colorful baits sometimes excel in this environment. Some anglers live for it, and it might be worth a few casts to eliminate the possibility. Bass junkies beat the banks this month, but, sometimes, pressured fisheries require something different. I’ve seen the shallow bite vanish on some amazing lakes after 200 anglers in bass boats descend upon it. Offshore humps, submerged roadbeds and other “hidden” sites become jewels. On some lakes, your graph will light up with fish, no matter the settings. Learn to distinguish which are bass. The formation is a giveaway. Even if they are bass, if they won’t bite, it’s “dead water,” as far as I’m concerned. It’s time to move on. My tournament partner, Logan, always says, “Keep it simple.” It’s his nervous mantra before the sun is up. He just hopes I don’t get crazy and fish the whole lake with my entire arsenal before noon. He’s often right on the mark. You don’t want to be schizophrenic out there. But I’ve also learned, there’s always more than one way to catch ’em. When you put 150 boats on a given fishery this time of year, guys catch them in a variety of ways, often depending upon personal preferences and fishing strengths. The point is, junk-fish until you stumble onto something; then, narrow it down. If possible, fish the way you like to. Do what you’re good at. The only thing certain this time of year is change. It’s constant. Be prepared to change. There are certain rules of thumb. It’s usually an “if this, then that” type of thing. If the water is clear, go with natural colors. If it’s warm and sunny, bass move up. But there are always exceptions. A cold front or storm this month will often slow the bite or “back them off.” The tendency is to slow down and fish deeper, especially if you are freezing, can’t feel your hands and can’t possibly retie a knot. Sometimes that’s the right move. But the water temperature may be much cozier than the air temperature, and the fish may be biting up a storm down there in 50-degree-plus water. Don’t freeze up mentally by locking down on a single spot, hoping a bass will pick up your bait. The surface chop or low light created by the front might be just enough to trigger big fish to bite. Try covering some water, instead. Maybe you’re just in the wrong spot.